A hat has great utility. It can keep the sun out of your eyes and protect your head. With flaps attached, it can even keep your ears warm. But we live in a society where hats really aren’t about utility anymore, instead they create the opportunity for us to show the world which causes/organizations we support and, of course, our favorite teams. The cowboy hat worn by non-cowboys is entirely another subject … but then I don’t understand quantum physics either. The ever-present baseball cap which has morphed into a traveling billboard is a marketing manager’s dream come true. Many of us will actually pay to advertise someone’s brand. When I was a kid, adults wore hats not only for utility, but as fashion statements, to signify their social standing. Instead of announcing to the world the identity of your favorite team, your hat could say, “I can afford season tickets.” Down through history people have wanted to communicate their wealth and social status and hats have served them well. I happened upon a picture of Abe Lincoln wearing his famous stovepipe (top) hat. He was our tallest president at 6-foot-4 and the crown of his hat was seven inches high. Rail thin, standing erect with his hat on, there was almost seven feet of vertical to observe. Some say it was his way to be seen in a crowd. Whatever his motivation, his top hat was his trademark and the top hat continued to symbolize authority and prestige well into the 1930s. 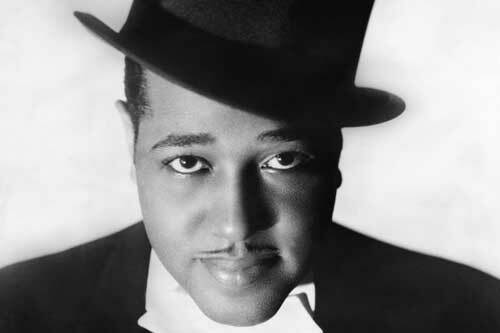 In 1934 a dapper Duke Ellington was photographed wearing a top hat, rakishly tilted to the side (as pictured above). The iconic image projected elegance and sophistication and in a very racist society, it was Duke’s way of saying “I am one of you.” The brand image worked. Duke was accepted by white audiences. However, in the 1930s to 1960s, most other African American jazz musicians were seen as undesirable outsiders. Jazz had been labeled as the devil’s music, so jazz musicians took the path of least resistance, developing their brand based upon the concept of being part of a subculture – the hipster – outside of the cultural mainstream, but stylish and at the cutting edge of what was happening. They succeeded by talking in a hip way (“the cat wants his bread before he blows his axe”) and by wearing jazzy clothes, the oversized zoot suit, for one, to signify their hipness. But it was their lids (initially, jazz slang for hats, not grass) where jazz musicians were able to set themselves apart. The legendary tenor saxophonist Lester “Prez” Young invented much of the hipsters’ jargon and was known for his ever present pork pie hat – circular low crown, flat on top with a brim slightly turned up. “Goodbye Pork Pie Hat” was written as an elegy upon Prez’ death and has become a jazz standard. Prez was so synonymous with being hip that Frank Sinatra wore a pork pie hat and today Marcus Miller’s trademark is the same style. One of the most celebrated jazz musicians of all time was world famous trumpeter John Birks “Dizzy” Gillespie, one of the “inventors” of be-bop and Afro-Cuban jazz. In the 1940s, his trademark look was the bent trumpet, horn-rimmed glasses, goatee, puffed cheeks when playing … and a beret. The beret is a soft, round, flat-crowned hat with modern origins in the Basque country and France. The adoption by the beatniks in the 1950s of jazz jargon and the look of the hipster with a goatee and beret can be traced back to Dizzy. And then there was Thelonious Sphere Monk, an eccentric but brilliant jazz giant whose piano playing and compositions changed the course of jazz. He had a cult following and was one of the few jazz musicians to ever be on the cover of “Time” magazine. Monk had a distinctive look with a goatee, sunglasses (worn in indoors) and was almost always wearing a unique hat. Hats were his trademark and early photos show Monk sporting a beret, but the crown on his lid was taller than Dizzy’s and the jazz tune “Hat and Beard” was written in his honor. He, too, influenced the beatniks and was seem as an arty bohemian. He was once photographed wearing a Chinese coolie hat, but he went through periods when he wore fedoras, trilbies (a fedora with small brim and higher crown), fur hats and skullcaps. Monk wasn’t the only musician to wear a skullcap. Many jazz musicians who have converted to Islam wear skullcaps. NEA Jazz Master pianist Ahmad Jamal (Fritz Jones) is a convert and has worn a skullcap for decades. The skullcap and the African kufi (brimless, short and rounded) are also worn by many African American jazz musicians who aren’t Muslims as a way to symbolize their connection to Africa. Then there is Dr. Lonnie Smith, who wears a turban. He isn’t a doctor and he is not from India, but he sure can play the Hammond B-3 organ. What a trademark.